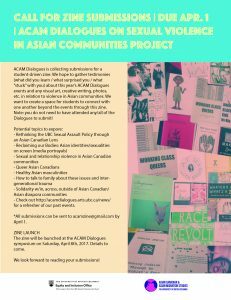 ACAM Dialogues Zine submission deadline has been extended to April 1st. ACAM Dialogues is collecting submissions for a student-driven zine. We hope to gather testimonies (what did you learn / what surprised you / what “stuck” with you) about this year’s ACAM Dialogues events and any visual art, creative writing, photos, etc. in relation to violence in Asian communities. We want to create a space for students to connect with one another beyond the events through this zine. Note: you do not need to have attended any/all of the Dialogues to submit!